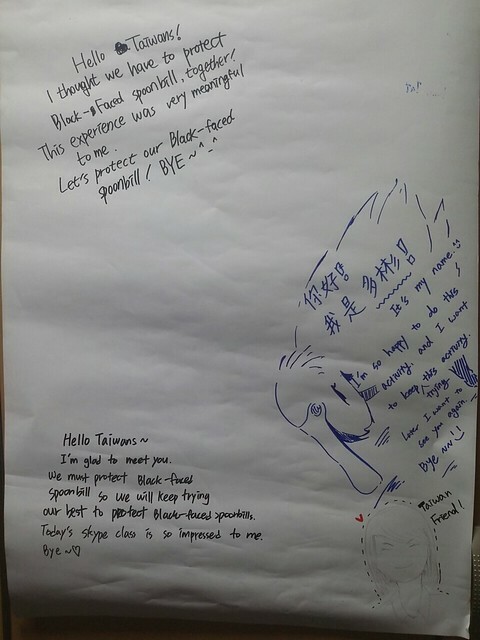 A ‘Black-faced Spoonbill International Youth Skype Meeting’ was held on 15 June 2016 between Taiwan and Incheon. 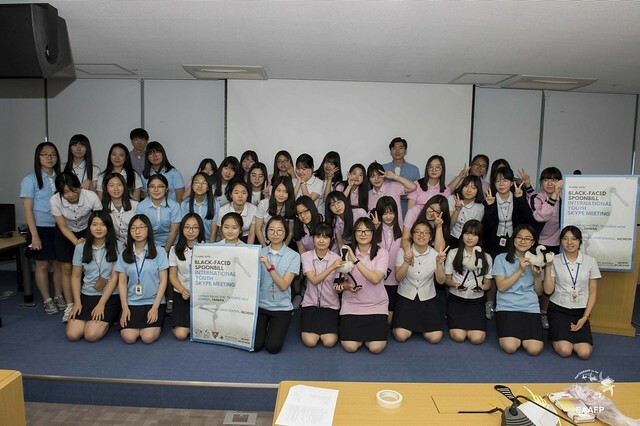 It was the second international youth Skype meeting organised by the Incheon Black-faced Spoonbill Network. It was held in cooperation with EAAFP, Friendly Seed, and Incheon City Government. Ten students from Tainan Municipal Tu Cheng High School and forty students from Yeonsu Girls’ High School participated in the meeting. Officers from Incheon City Government and several journalists also attended. The meeting was held as a part of an awareness raising programme, Black-faced Spoonbill Nature School, which provides opportunities for students in Incheon to learn about this symbolic bird of Incheon, Black-faced Spoonbill (BFS) and the importance of wetlands in Incheon. Staff and volunteers from the Incheon BFS Network and EAAFP visited the schools and delivered a series of lectures as well as conducting a field trip and organizing group works. As the final stage of the programme, the Skype meeting was held to give an opportunity for Incheon students to meet students from the wintering grounds of BFS and better understand that the species is a globally shared treasure and needs international cooperation to ensure its conservation. Students introduced topics such the plumage of BFS seen in each area, threats to the birds, and conservation activities. Students from Taiwan performed a small drama describing the plumage and the life of BFS in their region, which contributed a lot to the enjoyable and informal atmosphere. Then, the students discussed and shared their thoughts on how to deal with threats that were raised in the presentations, such as the lack of habitat, outbreak of disease, and habitat destruction. Solutions that students identified included the administrative measures to be taken, awareness raising campaign, and conservation activities. Looking back myself as a Korean, the Youths in Korea don’t have many chances to learn about migratory waterbirds, wetlands, and biodiversity. Such meetings convey a vivid experience to a young generation to understand why international cooperation is important for migratory waterbirds. By meeting other students from different BFS habitats, they can clearly understand that the bird is shared species among the countries of the flyway. I hope that the students learned through the programme the value of the ecosystem and necessity to conserve it. Actually, this is a very good opportunity to understand the world. By not only sticking to one opinion, but by also thinking about pros and cons, putting themselves in others’ shoes and understanding different situations, they understand that there are diverse interests and the wrong and the right actions cannot be judged easily like examples they learn in the textbook. 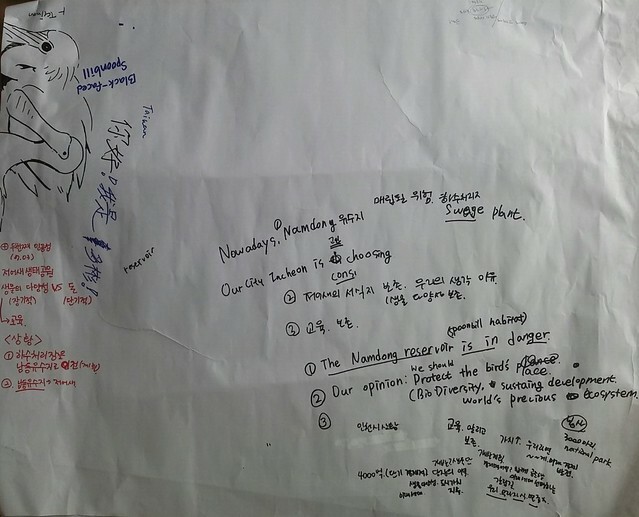 Below are some comments from the students in Incheon. The meeting was fun and it was a precious time where I became aware of the value of BFS that I did not know very well before. 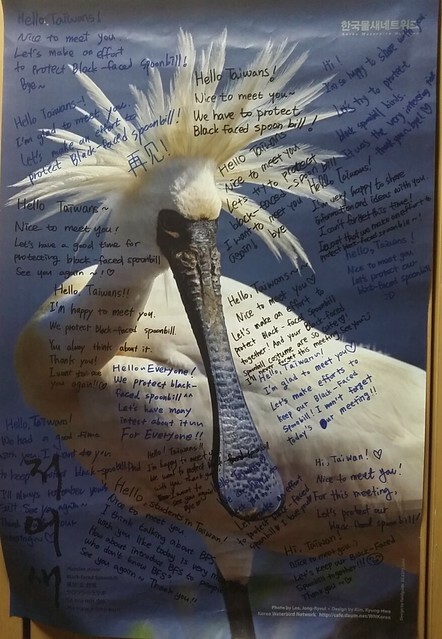 It was a good opportunity to learn about the black-faced spoonbills and I want to thank all the people from the organization for their efforts. I had not known anything about the BFS before preparing for this conference, which I regret now. Thanks to this event, I became interested in such conservation issues which I have not given much thought to before. I enjoyed this opportunity a lot. By participating in the discussion and talking about the threats BFS face with my friends, I started to think more about BFS. I enjoyed sharing and presenting my opinion today. It was a valuable and meaningful time.